Imagine you’ve booked a vacation and you end up with a connection through London’s Heathrow airport (LHR). And your long Heathrow layover is over 6 hours. Welcome to the world of long-haul travel. If you’re wondering what to do during a long layover, the answer is get out of the airport! Of course, you could spend those hours wandering around Heathrow’s Terminal 5, but why not get out of the airport, get some sunshine (hopefully), and see a little of London, England. So how much can you see on a long layover in London? It turns out, the answer is a lot. This London layover guide contains everything we learned, and everything you need to know to make the most of your time in this city, including a breakdown of options by length of layover. Prior to this trip, our experience with London had been minimal. I’ve never actually been to London. I know that sounds impossible with all of our travel, but it’s true. I’ve flown through Heathrow once or twice before, but never spent any time in the city. Laura has been here before twice – once during school and a few years ago on a quick visit during a London business trip. This trip would change all of that! We enlisted the help of two travel friends for ideas and set out on our ultimate Heathrow layover itinerary! Whether you have 5 hours or 20 hours, your layover in Heathrow will all start the same way: arrivals. When you get off the plane, you need to clear immigration and there can be a considerable wait here. U.S. citizens do not need a visa to enter the UK, however residents of other countries may need a LHR transit visa. However, we were required to produce three documents: a valid passport (obviously), the boarding pass for the flight we just got off and proof of onward travel (both the boarding passes for our next as well as a printed itinerary). Depending on how your flight was ticketed, it is likely your checked baggage will remain checked to your final destination. However, unless you want to take any hand luggage or carry-on bags with you, you’ll want to drop them off for the day (the British call this service “left luggage” but it is “baggage storage” for everyone else). Once officially admitted to the UK, drop any access baggage off at the Excess Baggage Company counter on the ground level (cost to store a bag is £12.500 for 24 hours). From there, you will need to get into London. Inside the Heathrow Airport arrivals hall, follow the signs to the Underground (this is just across the terminal lobby from the Excess Baggage Company storage counter in Terminal 5). For this little adventure, you will need a one-day travelcard valid for zones 1-6. If you have a pin-and-chip credit card, you can buy directly from the machines, otherwise, you can purchase from a teller (there may be a long wait for a teller). The cost for us on a Saturday was £17 and was valid for the Tube and all buses. Follow the signs to the Underground, take the escalator down two levels and get on the Piccadilly Underground line. If you follow in our footsteps, you’ll be going to the Green Park station. This will take approximately 50 minutes and a large part of it will be above ground so you’ll get to see some of the London suburbs. The Heathrow Express is a faster option than Underground. The Heathrow Express is the most direct London to Heathrow train option, but it is quite a bit more expensive the London Underground. The Heathrow Express drops you off at London Paddington Station, which means you need to take a second metro train to connect to this the self-guided London layover tour provided below. The Underground, despite being slower, saves you from needing to change trains at Paddington station. For those flush with cash and have time to burn, one of London’s famous black cabs can get you into the city…for a price. Because of London’s famous traffic, the taxi is actually a slower option than either of the trains. The cab will cost a minimum of £50 (~$70) take over an hour. Note: You can also pre-book a private car for about the same cost. A number of companies offer professional, chauffeured guided London tours from Heathrow for visitors on a layover. These London Heathrow layover tours tend to be quite a bit more expensive than the self-guided London layover tour we’ve outlined below, but they are an option. The one real advantage of the London bus tours from Heathrow airport is that you don’t need to handle any of the planning or logistics yourself. You can pre-book your guided Heathrow layover tour here. 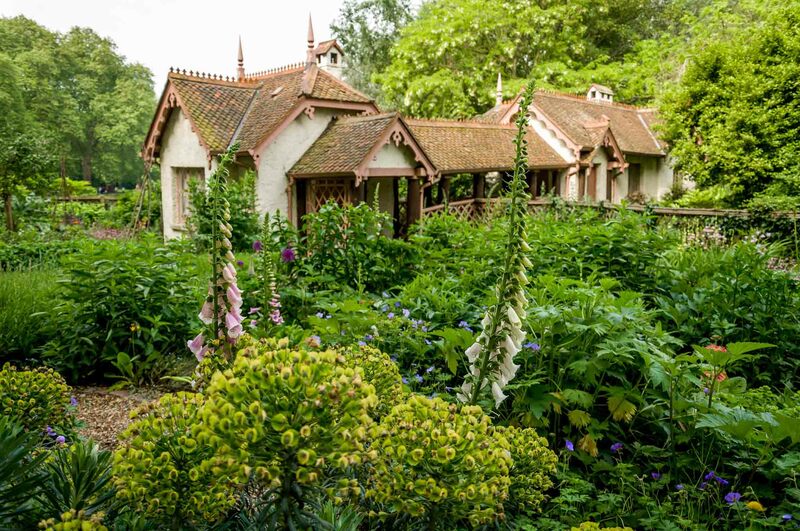 Now, your Heathrow layover adventure can begin! Assuming you’ve followed our instructions above for taking the London Underground from Heathrow to London, you’ll find yourself in Green Park. The Green Park tube station is actually the most direct route from Heathrow to Buckingham Palace! Once inside Green Park, walk down the gently sloping pathway to the trees on the far side of the park. 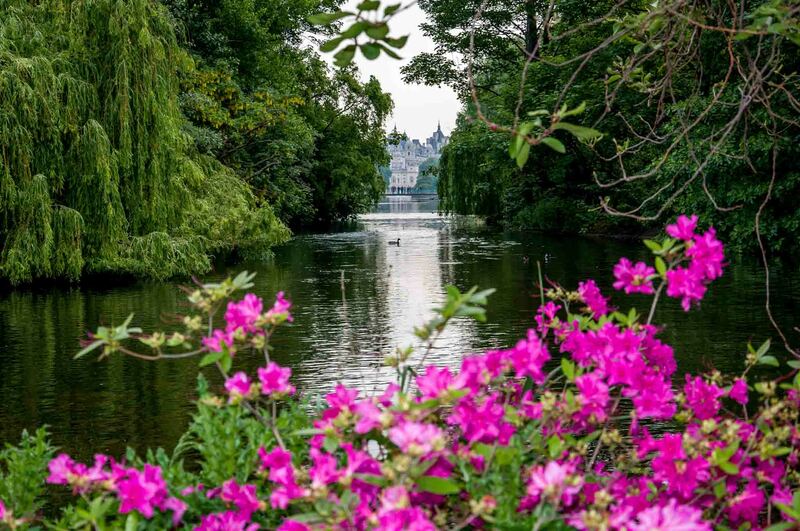 You might glimpse Buckingham Palace through the trees. If you are at the Palace around 11:00am, you’ll see the masses of people for the Changing of the Guard. As my friend Megan would say, be sure to “mill about smartly” in front of the Palace. After taking a million pictures, continue down the street opposite Buckingham Palace (known as the The Mall). At your first available opportunity, turn right on a path and go into St. James Park. The path will head downhill and lead you to a beautiful pond. Head towards your left and walk along the pond’s edge (be extremely careful not to step in the excessive amounts of bird droppings on the path) until you reach a footbridge over the pond. Be sure to stop for a few moments on the bridge and note the Princess Diana plaque. This is also a great photo vantage point of both Buckingham Palace (behind you) and the Central London skyline (in front of you). 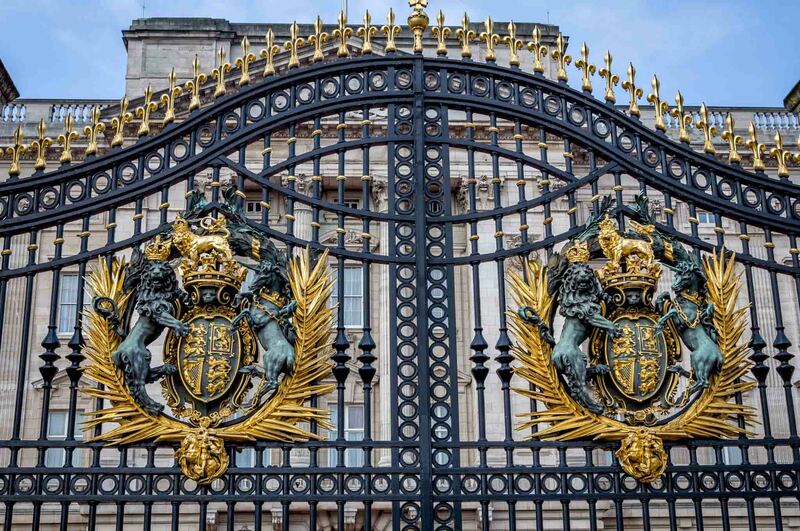 Continue through St. James Park to the Horse Guards grounds on the far side (crossing the Horse Guards Road – be sure to look in both directions for speeding cars!). As you cross the gravel courtyard, you’ll see an archway. Pass through the archway and see masses of tourists behaving inappropriately with the guards – trying to get them to break character. 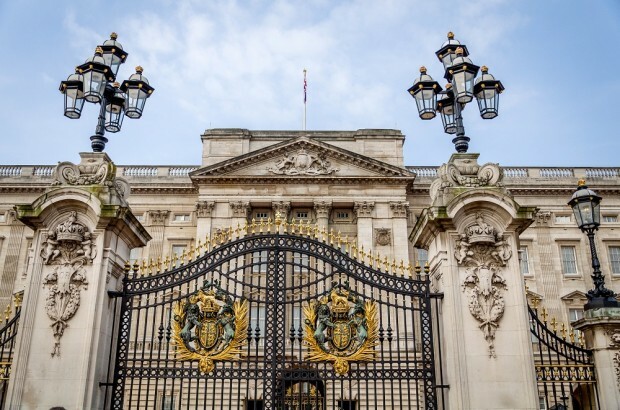 On the far side of the Horse Guards, make a right on Whitehall Street and go one block to see 10 Downing Street. 1. Continue two blocks past Downing Street and then make a left, crossing the Westminster Bridge. On the far bank, turn left and walk the entire South Bank of the Thames River, past the London Eye, the National Theatre, etc. Across the river, you’ll see St. Paul’s from a distance (you can cross back over the Millennium footbridge if you want to see St. Paul’s). Continue past the Globe Theatre, The Tate Modern, City Hall to the Tower Bridge. Admire the bridge and cross it to see the Tower of London. This is a total walk of approximately 2.5 miles. 2. If the weather is poor, jump on the Underground. Continue two blocks past Downing Street and to the Westminster Underground stop. From here, you can take the District or Circle lines on the Underground from Westminster Station to Tower of London station. (Be sure to check if the trains are running – we experienced construction so we were not able to take the train. We tried to take a bus, which wasn’t running due to a bicycle race in the city and ended up wasting an hour our of Heathrow layover. Ultimately, we ended up in a pricey black cab). 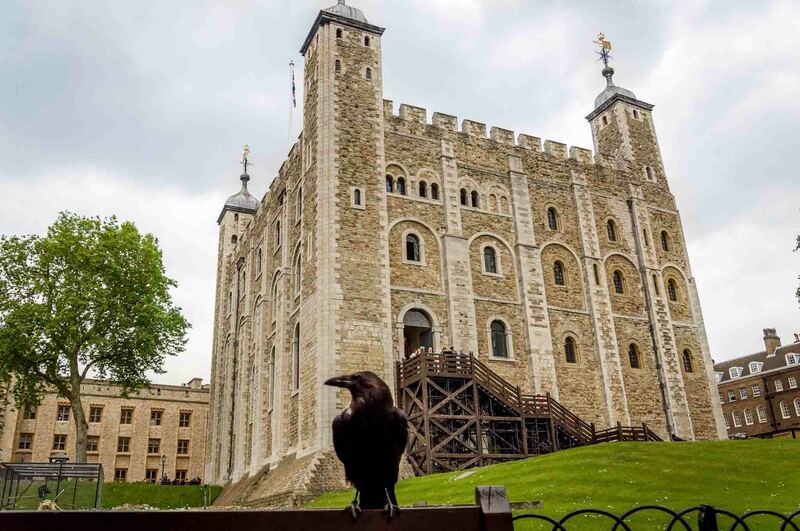 If you take the Tube, you’ll sacrifice the 2.5 mile walk, but end up with more time at the Tower of London. 3. Londoners agree that one of the best ways to see the city is by boat. You can get the boat from Westminster pier (near the train station) and take it to Tower Pier, right at the foot of the Tower of London. 4. If the weather is really bad, skip it all and go in search of the perfect Fish and Chips, followed by High Tea. No matter how you get there, your ultimate objective should be the Tower of London. This was the original royal residence and the center of the city’s history for hundreds of years. Now preserved as a UNESCO World Heritage Site, the Tower is a first-rate attraction. 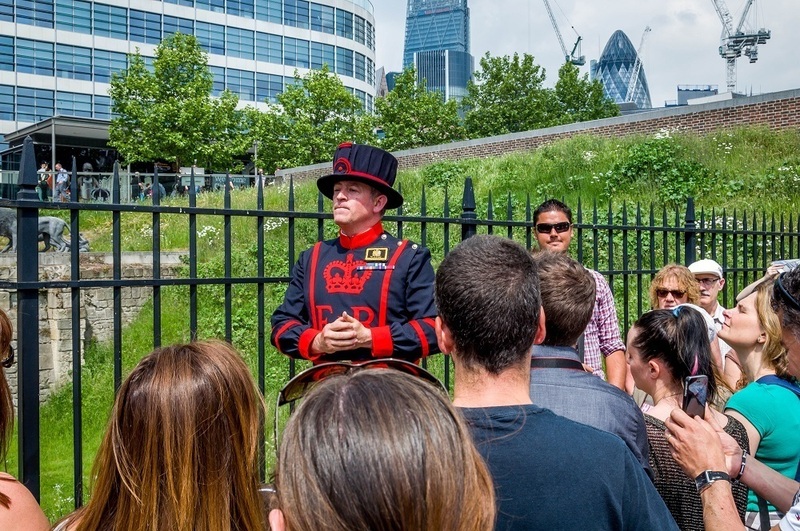 The tour given by the guards (called Beefeaters) is a fantastic overview to the Tower explaining its dual purpose as Royal residence and also prison. After the Beefeater Tour, spend some time wandering around the walled ramparts and visiting the Treasury to see the royal jewels. (We found the Treasury to be much more manageable and better organized than similar exhibits elsewhere, such as Vienna’s Hofburg Palace). By this time, you’re probably a little tired from your long, sleepless night on the overnight flight. I know my flight to London left me completely drained. You’re also probably a little hungry. There are numerous restaurants and street food in the Tower of London area. 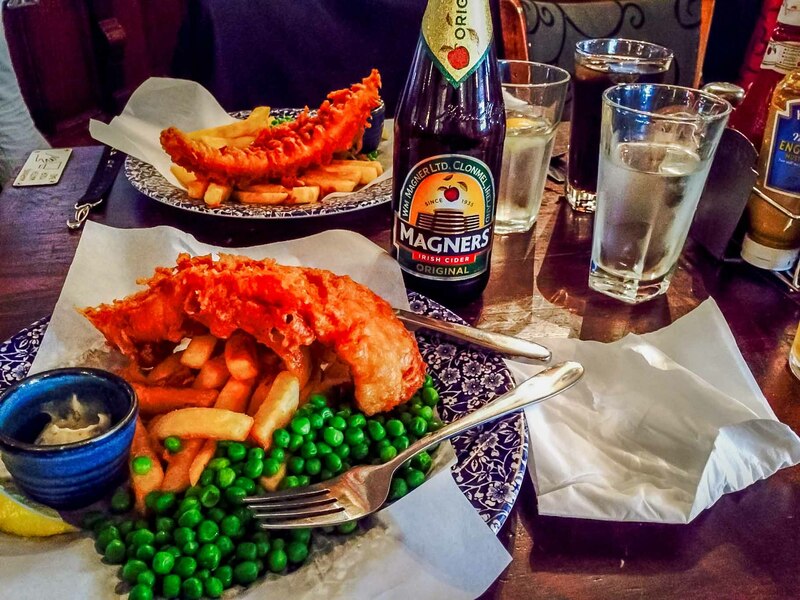 We oped for the perfect fish and chips at a nearby pub! 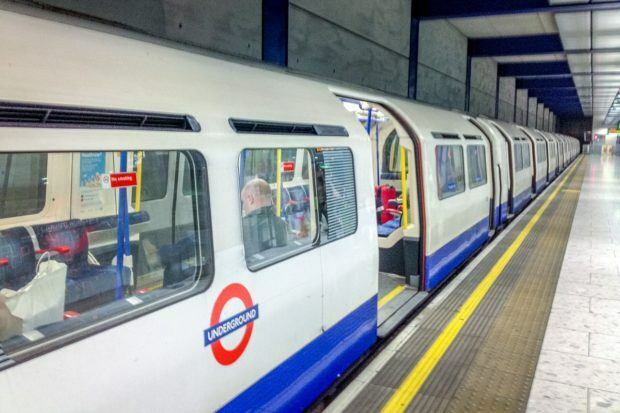 When you finally tire of the fun, make your way back to the Underground and transfer to the Piccadilly line, taking it back to London’s Heathrow airport (last stop). London is a world class city and there is so much to do! A person could spend weeks exploring this city. A 13-hour Heathrow layover is nothing more than a quick taste. I can’t believe I’ve never been to London before! This quick visit has made me want to come back. Everyone’s definition of a long layover is different. If you’re asking yourself the question, ‘how long of a layover do I need to see London,’ the answer is at least six hours. Here are our recommendations on what to focus on, depending on how much time you have during your flight layover. Be sure to keep in mind that it takes a minimum of one hour each way to get to and from Heathrow airport. Also, when going back to LHR, you will need to pick up any baggage you may have checked (at the excess baggage left luggage counter), clear security, and also immigration. You should allow two hours, plus any transit time. If you have less than 6 hours, you’re really not going to be able to leave the airport. With this amount of time, you’ll need to think about things to do in Heathrow airport. After an overnight flight, the first thing we try to do is get a shower. Check out our guide to Heathrow showers. Then, we usually visit the VIP and maybe do some duty free shopping. You probably won’t have time for much more than that during your short layover at Heathrow. Remember it takes one hour each way to and from London, so don’t spread yourself too thin. You won’t have much time and you’ll really need to keep moving. Using the itinerary above, focus on the one or two things you really care to see. Our recommendation is to focus on Buckingham Palace or the Tower of London. You probably won’t have enough time to do both, so you’ll need to visit London again to see it all! Option A: Buckingham Palace, St. James Park, Horse Guards, 10 Downing Street, and Westminster Abbey. A quick lunch of fast food somewhere. Option B: The Tower of London, plus a quick lunch near the Tower Bridge. Option A: Green Park, Buckingham Palace, St. James Park, Horse Guards, 10 Downing Street, and Westminster Abbey. Proper British lunch either near Westminster Abbey or Trafalgar Square. Option B: The Tower of London, plus a lunch of proper British fish & chips along with a nice cold pint. This may seem like a lot of time, but you’re going to have to make compromises. We recommend focusing on: Buckingham Palace, St. James Park, Horse Guards, 10 Downing Street, and then the Tower of London. If you have any extra time, see Westminster Abbey. Don’t waste time on lunch, instead grab a quick takeaway or fast food. Our complete itinerary may be possible in this amount of time, but you might need to make compromises. Focus on: Green Park, Buckingham Palace, St. James Park, Horse Guards, 10 Downing Street, Westminster Abbey, and then the Tower of London. If you have any extra time, get a proper British fish & chips lunch. Our complete itinerary should still be possible in this amount of time. Focus on: Green Park, Buckingham Palace, St. James Park, Horse Guards, 10 Downing Street, Westminster Abbey, a proper British lunch of fish & chips complete with a pint, and then the Tower of London. One of the shorter London city tours from Heathrow would be possible in this amount of time. You should easily be able to complete our self-guided itinerary above in this amount of time. 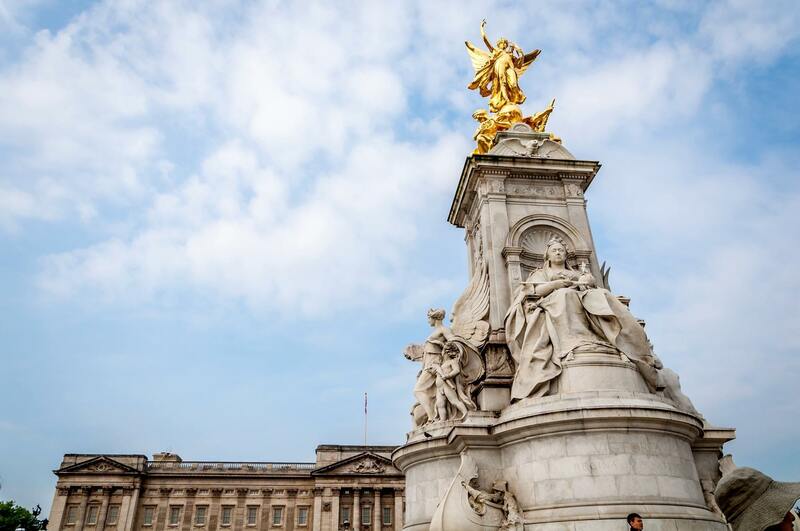 Our recommendation is to focus on the itinerary above: Green Park, Buckingham Palace, St. James Park, Horse Guards, 10 Downing Street, Westminster Abbey, a proper British lunch of fish & chips complete with a pint, and then the Tower of London. You would also be able to complete one of the London day tours from Heathrow airport in this amount of time. This is a good, long, proper layover. Put differently, this is really the answer to what to do in London for a day. 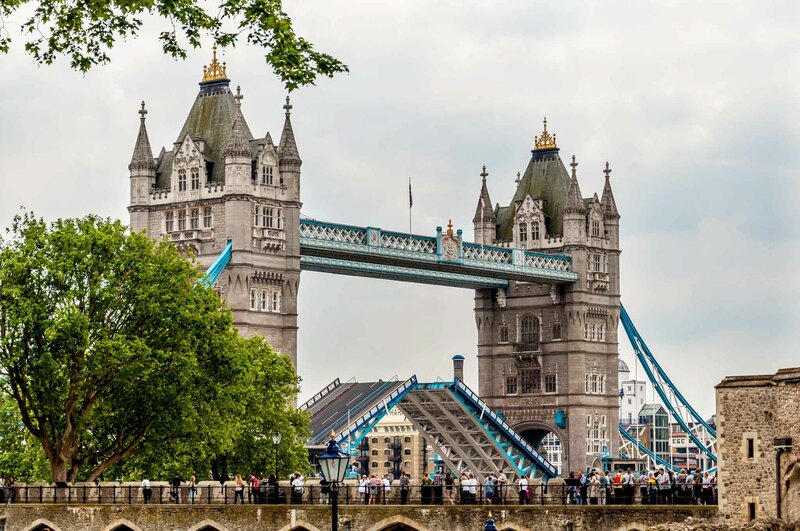 Our recommendation is to focus on the itinerary above: Green Park, Buckingham Palace, St. James Park, Horse Guards, 10 Downing Street, Westminster Abbey, a proper British lunch of fish & chips complete with a pint, and then the Tower of London. You’ll be able to do this at a fairly leisurely pace. Special thanks to our friends Megan and Indiana Jo for their help in putting together this ultimate long Heathrow layover itinerary. Some links may be affiliate links, which means Travel Addicts may earn a few pennies if you decide to purchase something. 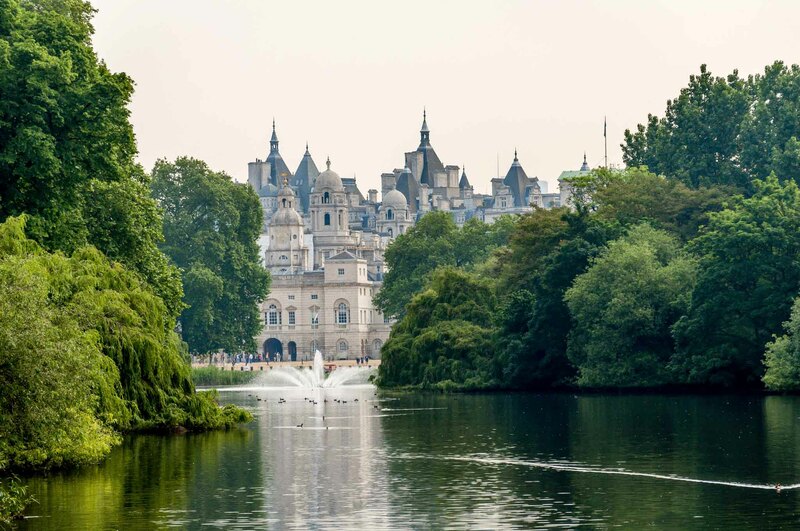 What do you think about Seeing London on a Long Heathrow Layover? I did this years ago on a 9 hour layover. I was traveling with someone who had never been. Thankfully security was easier then…got to spend a few hours! Great work to you for doing this! Definitely on the list! Hope to get back to London soon. I think you guys did a pretty job in the short space of time you had. Beautiful shot from St. James Park Footbridge, BTW! Because London is such a vast city, spread over a large area it’s easy to lose a lot of time trying to move from place to place. People who have only a few hours in London will find that time best spent by focusing on one main area. Excellent! I’m often in that situation, with hours to spend but a bit too lazy to plan it all out. As a result I have an intimate knowledge of more airports than I care to mention. So next time I’m in London I won’t need a plan – I have yours! Awesome guide! I love using long layovers to get out and see a snippet of the destination if at all possible. If I have a choice between five hours and twelve, I always choose the latter. This seriously made me want to get back to London! I’m glad 🙂 We also chose the long layover on purpose so we could explore a bit. I too did this years ago on an 8 hour long layover. It was also my first visit to London and I got myself a hop-on hop-off ticket and popped around to as many sights as I could. Whenever I have a chance to get out an explore as opposed to sitting in the airport, I always take advantage to do that! I’m not usually a huge fan of the hop-on-hop-off thing, but I actually did one in London once on a previous visit that was also under tight time constraints. It was an excellent way to see a lot in a short period of time. These are great tips! We usually get stuck with long layovers like that since we try to get the cheapest ticket so it’s great to read some tips on what to do during that time. It actually works out pretty well, you get to go out and sightsee for a bit. Definitely using this when we go to London because knowing us we will probably have a long layover haha. I just love London! Great tips about how to best spend it during a layover. Great tips!! Can’t wait to get back there this fall! Wow you guys really crammed a lot into one layover. I’m impressed! Looks like you had the quintessential London experience in just 13 hours! Well done! That fish and chips at the end there looks especially delicious, if I ever make it to London (even just for 13 hours) I will absolutely be indulging in the same! You saw quite a bit in just 13 hours! Well done! London is one of my favorite cities in the world. Honestly, as someone who has been to London a dozen times and isn’t a huge fan, 13 hours is the way to go 😉 Enough to get a taste for the city before you start experiencing all its annoyances! My friend and I only have 7 1/2 hr layover. Could we still see some of the sights? Say Westminster, palace,and Big Ben? What do you think? Absolutely. In 7 1/2 hours, you can easily see Westminster and the St. James Park. Big Ben may be possible. We always worry about missing the next flight, so we tend to be conservative. But in 7 1/2 hours, you should be able to do something meaningful. Haha…looks like a lot of us have done it the same way 😉 My layover was only 7 hour but I got to see the Palace. I had my little carry on suitcase and it started to pour 🙁 Both my bag and I got soaked. That was the extent of my 7 hour layover adventure. Wow that’s quite a busy 17 hours. Glad you were able to go to London and see a few sights. It’s been a few years since my visit and I definitely want to go back. It definitely was busy. Made us a little exhausted by the time we got to South Africa. We’re going back later this year Alouise to do London properly! 1. If I get a travel card for a day (~ £17) as you have mentioned, which rides would be included? Piccadilly, Circle both of them? Because it seems from the Tower of London I don’t have the luxury of boarding Piccadilly underground. I have to take Circle train till Gloucester Road and then from there I can ride on Piccadilly till LHR 5. So trip using Circle would be included in the Travel Card too? Please confirm! 2. If I take a boat from Westminster Pier to Tower Pier while reaching the Tower of London, will the same travel card be valid for this trip as well? Or do I need to pay extra for this? Kindly confirm! 3. USDs are accepted for payments to restaurants in London? Or only GBPs? Please confirm! Would appreciate if you get sometime to answer to my questions really soon as my travel starts in the next few days. Avik, It would be best to check on the website for the London Pass. However, if I recall correctly, all London trains are included, including the dockland railroad and also buses. I don’t believe the boats are included with the travel card. US Dollars are not accepted in the UK. All payment is in British pounds or credit cards (the credit card company will do the conversion for you). You are absolutely correct. I saw it is mentioned here : http://www.londontravelpass.com/faqs.html that it can be used within Zones 1-6 on London’s local buses, London Underground, National Rail Trains, Docklands Light Rail, and the Tramlink. Also yes, the boats are NOT included in the travel card as you have mentioned. So I assume I can take a bus from London Eye to London Tower as well, right? I assume the bus would be an option, although have not personally researched it. If it were me, I’d walk across the Jubilee Bridge and then take the Cirlce Line to the Tower Hill stop. Thanks a lot Lance! Your responses have helped me a lot in this case. Would get back to you if required. one more question I had. I am travelling from India to the USA and hold a valid indian passport and US visa. So do I require transit visa for this plan (i.e. roaming around London for a few hours during the 9.5 hours layover) when leaving the airport and passing through UK customs/immigration? Avik, sorry, I don’t know the answer to that. For us, U.S. citizens on a U.S. passport, we did not need a special visa. HOWEVER, we were required to show three documents: The passport (obviously), also the ticket from the flight we just deplaned and finally, we had to show proof of on-ward travel to Africa (both the tickets as well as our itinerary document). I should update this post with that information. Thanks for reminding me. Sure Lance, Thanks! Great help indeed! Thank you for posting!!! This really helped! I have the same case as yours. Indian national, going to US, valid US visa. and with a possible layover of 15 hrs in London, I m planning to use this time to catch up with sm frnds n roam around. However, were you able to get out of airport only by showing boarding pass, passports n itinerary? or Do i need to arrange for any visa etc. What can one do with 13 EVENING Hours?